To the tens of thousands of banks, lenders, credit card companies, and financial organizations in the U.S., you are just a number. You’re a number on a long list of numbers, personally defined only by characteristics like your loan balance, credit score, payment history, and profile as a consumer. They aren’t in business to help you, serve you, or solve any of your problems or challenges. Instead, they’re in business for one reason only – to make as much money as possible. To your credit card company, it’s all business. However, too many consumers and borrowers don’t realize that. Instead, they feel a pressing ethical or even moral obligation to pay their debts. The vast majority of people think of themselves as upstanding, responsible people whose word is oak-solid so they always pay back their debts. Don’t get me wrong – that’s a good thing. It keeps most people on track with paying every month and holding up their end of the bargain on that financial contract. But sometimes life throws us a curveball with a job loss, medical problem, divorce, or unexpected major repair or expenditure, causing us financial hardship and sometimes even insolvency. At that point, the arrangement falls short when it’s just business to the lender but much more to the borrower. In fact, wealthy people and businesses across America realize this, they make smart business decisions about debt and financial obligations every day. 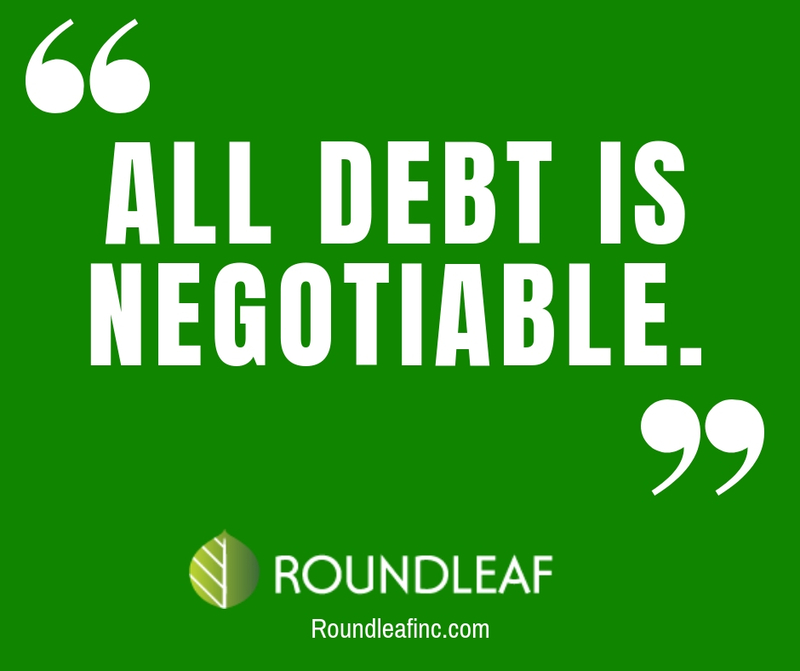 All debt is negotiable, along with just about everything else in any business deal or relationship. Millionaires (and billionaires), CEOs, and even our government wrangle over the fine print over their financial deals nonstop, whether it’s asking for debt amnesty, rewriting terms on loans, or rethinking trade agreements. That’s just what debt settlement is – a good-faith negotiation between two parties that have a business relationship. Most people don’t realize it’s possible to renegotiate the terms and payments of their credit cards, medical debt, and other loans, but it’s still a practice that goes on every single day. There are several ways a debt negotiation may manifest, starting with simply calling up the lender to see if you can make some sort of arrangement, all the way to the legal process of bankruptcy. But along the way, the most effective method for negotiation debt is through a debt settlement in which Roundleaf Inc. will communicate directly with your lender, working out an arrangement where you can pay back far less than what it owed or your original balance. Again, it’s just business for these banks or lenders, and they always project a certain percentage of their loans as bad or unrecoverable debt. They know that X percent of their loan will either end up unpaid or in bankruptcy. Speaking of that math, let’s look why a debt negotiation and settlement doesn’t really hurt a bank or lender. If you borrow $10,000 on a credit card, for instance, you’re not just paying back $10,000, of course. Instead, at the average credit card interest rate these days of 17% and $50 per month minimum payments, you’d pay $8,061 in interest alone to pay that balance off. That means your original $10,000 balance plus $8,061 equals $18,061 total to the lender – nearly double the lender’s original investment. Many credit cards and lenders tack on late charges, yearly fees, and charge much higher interest rates, too, so their profits are even more swollen. Therefore, if they have to write off a small fraction of that profit in the form of debt negotiations, they don’t really bat an eye. Even during the financial collapse and Great Recession from 2008-2012 where there was a run on bankruptcies and unpaid debt, banks made record profits! Remember, too, that your lender actually prefers you negotiate and settle debt as opposed to just ignoring them and leaving them unpaid or, worse even, filing Chapter 7 bankruptcy, a process where they’re legally blocked from attempting to recover debt so they’ll get nothing. That’s the worst-case scenario for lenders, so they would much rather have you contact them and work out a mutually-agreeable solution in the form of a debt settlement. So, how does the actual process of debt negotiations and settlements work? Which debts work best with that program and which loans are not a good candidate? What results might you expect? 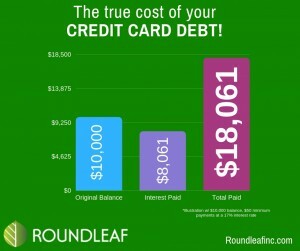 And what’s the downside or risk to debt settlement (and why it’s best for Roundleaf to represent you in these negotiations)? We’ll cover all of those important questions and much more in our blog next week, or feel free to contact us any time.